College of the Ozarks is an applicant for candidacy with the Transnational Association of Christian Colleges and Schools (TRACS), [15935 Forest Road, Forest, VA 24551; Telephone: (434) 525-9539; email: info@tracs.org]. TRACS is recognized by the United States Department of Education, the Council for Higher Education Accreditation and the International Network for Quality Assurance Agencies in Higher Education (INQAAHE). Filing a Complaint with TRACS - An individual may make an inquiry to TRACS regarding complaint procedures, or about issues and concerns that could be considered complaints, by visiting www.tracs.com and downloading the packet containing the Policies and Procedures for Complaints Against Member Institutions, the TRACS Complaint Information Sheet, and the TRACS Complaint Processing Form. TRACS response and its obligations to meet the specific timetables outlined in these procedures will begin only after the complainant submits all documents required in the TRACS Complaint Information Sheet. Founded by an early Presbyterian missionary, College of the Ozarks is an interdenominational Christian, four-year Work College. Its decidedly Christian nature is reflected by full membership in the Council for Christian Colleges and Universities, and the National Association of Evangelicals. All students are responsible for keeping informed of all policies and procedures in this catalog and other official college publications and for meeting the requirements for graduation. 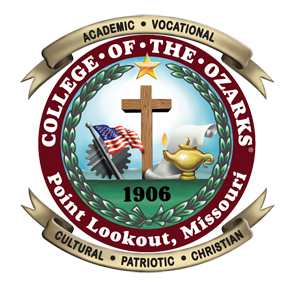 College of the Ozarks makes no claim that any specific course of study will necessarily lead to positions of employment. College of the Ozarks reserves the right to change any of the rules and regulations of the College at any time, including those relating to admission, instruction and graduation. The right to withdraw curricula and specific courses, alter course content, change the calendar, and impose or increase fees similarly is reserved. All such changes are effective at such times as the proper authorities determine and may apply not only to prospective students but also to those who already are enrolled in the College. The online version of the catalog (www.cofo.edu) will be updated more frequently than the printed version. Prospective students should contact the Office of Admissions for information regarding possible changes. Currently enrolled students should consult the Dean of the College.